Shells raised by the single extractor for manual removal get well within reach. Shells raised by the single extractor for manual removal get well out there within reach. Both over/unders and side-by-side shotguns are common, and most dedicated shooters have seen a few drillings, with either two shotgun barrels over a rifle barrel or, less commonly, two rifle barrels over a shotgun barrel. But three-barrel shotguns are definitely uncommon. Back in the 1991 Gun Digest, Larry Sterett wrote a gun review about just such a gun. Manufactured in Italy by Armi Silma, and imported and distributed in the U.S. by Armsport, Inc., of Miami, Florida, it was simply labeled the Trilling. In Germany, it would be a Flintendrilling drei Schrotläufe, or three-barrel shotgun with smooth barrels. The business end of this shotgun is undoubtedly impressive. To obtain an idea of where the Trilling would center its patterns and exactly what the chokes were, the test gun was patterned at 40 yards using the Fiocchi VIP heavy (3, 1⅛, 7½) load containing an average of 392 pellets per shell by actual count. Five shots were put through each barrel to obtain an average, and the 16-field pattern was used as a standard for comparison. Regulating two-barrel shotguns to center patterns to the same point of aim is a time-consuming task; adding a third barrel creates a whole new problem. It was assumed the Trilling would throw its patterns high, which it did, so the aiming point was placed on the lower half of the 48-inch square pattern sheets. The under barrel centered its patterns 7¾ inches above the point of aim, and just over 2¾ inches to the left. Average for the five shots was 34.2 percent with 44.1 percent of this total within the four center fields. The generally accepted percentages for an Improved Cylinder choke is 35 to 45 percent. Averaging 66.1 percent, of which 35.9 percent was within the four center fields, the right barrel centered its patterns just over 14 inches above and 2¼ inches to the right of the point-of-aim. Modified choke patterns average from 45 to 60 percent of the shot charge in a 30-inch circle, depending on the reference source, so the right barrel was actually producing Improved Modified patterns with this particular load. The left barrel centered patterns 14 inches high and 6½ inches to the left of the point of aim. Averaging 68.1 percent, with 37.1 percent of this total located in the center fields, the left barrel patterns with this load as Improved Modified. The Armsport Model 2900 Trilling has a streamlined appearance and nicely-figured walnut in the stock and forearm. The Trilling feels lighter in the hands than it actually weighs, with the center of gravity located at a point ½-inch to the rear of the hinge pin center. It handled well in use, and produced acceptable patterns, some a bit high. It definitely has lots of possibilities. The $2900 price is not out of line for the type. To read more about this unique shotgun, including how it performed at the trap range, access the 1991 Gun Digest – and get unlimited access to more than 130 other Gun Digest titles! – by subscribing to Gun Digest eBooks. Or, you can also order a copy of the entire 69-year Gun Digest Book Archive on a 3-disc set. 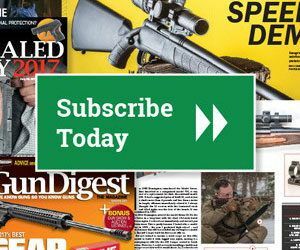 Thanks for visiting gundigest.com, and for reading the Inside Gun Digest Books blog. ❰Newhall: Have We Forgotten the Lessons for Combat and Self Defense? Better known as a Schretdrillinge. I would really like to see a video of this shotgun in action. If it were not for the high price this would have been an ideal shotgun, all the advantages of a double barrel and an automatic shotgun with its 3 shot capacity. I have never needed more than 3 shots when hunting but I have needed a third shot many times which is not possible with a 2 shot shotgun. I agree, it costs too much. I would like to have one, but not at this price.